Employee satisfaction matters to us. It's the cargo up front in the cab (our drivers) that we truly value! As a short haul regional carrier our routes give drivers the opportunity to get home most nights. We support a healthy work-life balance, spending quality time with the people you love the most. More than just a job...a career! Our drivers are our #1 asset and their job satisfaction is our top concern. We will not be satisfied until you are! Our goal is for you to get all the miles you want and the home time that you need. But we will not stop there. We will consult with you to develop a working plan that is the right choice for you. As an owner-operator working with Van Kam, you’ll have the freedom of running your own business, plus the backing of a large, stable, transportation company. The opportunity to service Van Kam’s large customer base will keep your business moving and your revenue growing. I like being on the road most of the day and having the freedom to not be stuck somewhere. I also like to meet new people. I like working at Van Kam because the people here are very friendly and we always help each other. I feel I have a family here. I like to spend time with my coworkers and see the happy faces of my customers every time I deliver freight to them. READY TO ROLL IN STYLE? Imagine cruising the open road in trucks so new and loaded with features, everyone wants to check'em out. 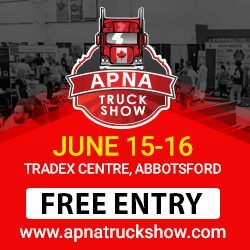 Apna Truck Show is a 2 day event being held from 15th June to 16th June 2019 at the Tradex – Trade & Exhibition Centre in Abbotsford, Canada. This event showcases product from Auto industry. Apna Truck Show will be held for a period of two days in Abbotsford, Canada and Van Kam will be a part of it. Looking for a new career? Come and meet us in person at our booth! Knowing the CB lingo is part of being a trucker. It’s truck driver culture. You gotta walk the walk and talk the talk. More Benefits. More Stability. More Safety. More Respect. More Recognition. More Passion.